Cross-inspired by the music of Erik Satie and the precision-randomness paradox of quantum physics and infused with creative improvised music, jazz, and psychedelic '70s and '80s rock, Velvet Gentlemen is an earful experience. 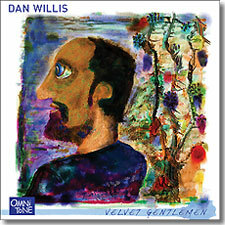 Dan Willis, one of New York City's most active and versatile woodwind specialists, is known for regular performances across a wide spectrum of music from jazz to Broadway to classical to improvised new music, including as a prominently-heard member of the John Hollenbeck Large Ensemble and the all-star "Downtown" virtuoso chamber ensemble, Area 31. Versatile and limber septet includes the prolific drummer/composer John Hollenbeck, leader of the Grammy-nominated John Hollenbeck Large Ensemble and Claudia Quintet, who is developing a wide following among jazz, rock-improv, and new classical circles. Buy Velvet Gentlemen now at the OmniToneStore.